DVD ISO files are actually images of complete DVDs compiled as one whole image file (*.iso), just like Ghost does for hard disks and partitions. DVD ISO images can be loaded into several different DVD recording software packages to create DVDs. VLC out of the box should be able to play iso image of a DVD movie. But with Atrix 4G, the most powerful smartphone in the world, doesn’t support to play and enjoy DVD ISO movies. No matter your DVD ISO files come from, you can’t play them on your new Motorola Atrix 4G smartphone. We need a good DVD ISO to Atrix 4G converter to transcode DVD ISO to Motorola Atrix 4G supported formats like MPEG-4, H.264, H.263, MP4. Aunsoft DVD Ripper is the best DVD ISO File to Atrix 4G Converter on Windows XP, Windows Vista and Windows 7. Step 1. Load DVD ISO to Aunsoft DVD Ripper. Run Aunsoft DVD Ripper as your superior DVD ISO to Atrix 4G converter, and click the "IFO/ISO" button to choose the DVD ISO image file from computer hard drive. Step 2. Choose Motorola Atrix 4G MP4 format. Step 3. 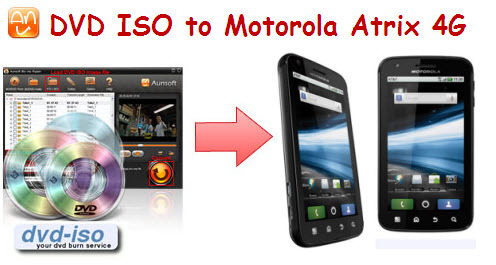 Convert DVD ISO to MP4 for your Motorola Atrix 4G. Click the convert button under the preview window, and the conversion from DVD ISO to Atrix 4G MP4 starts right away. You can then transfer and mount DVD movies to Verizon Atrix 4G, and play videos with the 4.3-inch multi-touch screen. If you want to play MKV video to Atrix 4G, AVI video with Xvid on Atrix 4G, and other formats like MTS/M2T/M2TS, MOV, you may use Aunsoft Blu-ray Video Converter Ultimate as the fast Atrix 4G video converter Ultimate. With this Windows Atrix 4G video converter ultimate, you can also compress Blu-ray ISO, DVD ISO to Atrix 4G, if you install VirturalDrive Pro on your computer with Windows XP, Windows Vista, Windows 7.